As calmly as I could I called out to Todd in the other room that I needed a towel because my water just broke to which he replied with a startled expletive and I heard a bunch of panicked rustling in the direction of the towel closet. Since the fluid was still leaking out a bit I caught some in a cup to make sure that it was clear and odorless – both important signs to rule out it being actual pee and show that there weren’t any signs in the fluid that the baby might be in distress. I always felt a bit nervous about my water breaking while I was out in public or sitting on a friend’s new couch or something so I was thankful that I happened to be sitting on a rubber mat at home when it happened. Best case scenario for sure! I looked up at the clock and realized that it was a few minutes before midnight on May 6th which meant that unless I had a crazy long labor for already being 4cm dilated and 90% effaced (according to my midwife visit a few days before), I was definitely going to have a birthday baby. I guess she was listening to her Daddy the whole time! I grabbed my phone and called our birth center who patched me through to the midwife on call and she told me to try and go to sleep since I wasn’t really having contractions and didn’t have any bloody show yet. She said they’d call me in the morning to check in on my progress unless I called them before that so I put on my pjs and nervously tried to fall asleep—fat chance of that happening, right?! I may have eventually drifted off but Lola had other plans and it wasn’t more than a half hour before my contractions had not only started (the period type cramps that had been happening with Braxton Hicks on and off for a few weeks) but already progressed to a strength where it literally took my breath away with how strong the sensation got. Uh oh, I thought, this is going to be rough if that’s just the beginning. That’s when I hopped out of bed and started to make sure Todd got all the birth bag items in the car while I timed the contractions and put on some makeup between each one to distract myself. Once the contractions were 2-3 minutes apart we drove over to the birth center at about 4am (worst car ride ever!!) and found out I was at 5cm and fully effaced so we got settled into one of the birthing suites. Our doula Jessica met us at the center and I labored in the birthing suite until about 10am with her and Todd taking turns applying counter pressure on my lower back with each contraction. I personally understand now why they say that lying down is one of the worst positions to be in so you want to be somewhere where they will let you move around. Anytime I would lie or sit down the pain was probably 3 times worse for me (which is why the car ride over was pure hell) so I only wanted to be in positions where I was on my knees leaning forward when a contraction hit. I had been looking forward to being in water for the birth (I heard the warm water feels so good and helps you relax) and while I did labor in the tub for a few hours, I had to stay on my knees leaned over the side the whole time for pain management so I was never really able to fully relax and melt into the water laying down like I had hoped. I know some people get sick and throw up a lot and since I had a pretty nauseous pregnancy I wondered if that would happen to me too…YEP! I actually got sick so many times in labor that I had sores all over my tongue for days afterwards from the acid and I literally couldn’t speak clearly because my tongue was so swollen. Gross. Anyways, going into a first-time natural labor it’s a bit hard to totally feel prepared for the pain level since you’ve never done it before, and while everyone’s experience is different, let me tell you, it was pretty painful for me. Like WOAH. I definitely had the thought over and over again of “I don’t know if I can do this” but I would look at Todd and he would tell me I could and I would repeat it aloud over and over again until I started to believe it. I always thought that the hardest part of labor would be the contractions into the transition phase, but while transition was the most painful part for sure, the hardest part for me was the pushing. The pushing part didn’t come quite as naturally for me as I would have thought it would—you are kind of using your muscles in a completely different way from how you ever have before so it took a long time to get the idea of what a “good” push should feel like. The birth center midwife Margaret was so great and was helping by pushing down on parts of my cervix or vaginal canal (it was somewhere around there, hard for me to tell at that point!) and telling me to focus on pushing in that spot. I asked later and they said that an hour is about average for pushing time but I spent at least 2 1/2 hours pushing and it felt like an eternity. Our midwife and doula kept changing positions to see what would make more progress from kneeling or laying on the bed, using the birth stool, and hanging from what looks like a giant ladder attached to the wall, but it felt as though it was never going to happen even though I was trying so hard. I didn’t know if I would be a “vocal” person in labor, but man did I scream during those pushes! They had been checking Lola’s heart rate the whole time periodically with a hand-held doppler to make sure she was ok and they were always impressed with how strong her heartbeat was throughout labor, so when she finally dropped into the birth canal and was crowning they became concerned when her heart rate dropped low and wasn’t recovering. As a testament to our team, it really was a true emergency to be alarmed about but our midwife very calmly told me that they needed to get Baby out faster so she was was going to do an episiotomy to help me push her through now. Even though I’m only a couple of months out from the event and the memory of the overall pain has faded quite a bit, those sharp cuts are something I can still feel very clearly if I let myself think about it and I shudder every time I do. They had to cut several times but within a matter of a few minutes she was out and I felt a giant sense of relief as they laid this rather purple looking baby on my chest. I’m sure there were many emotions running through my head and it all felt rather fuzzy at the time, but I mostly just remember feeling a sense of shock and disbelief, like, “What? Was this baby in there this whole time?? Where did she come from? ?” Some mamas will say their baby looked just “right” to them when they were finally born, like they had imagined them correctly the whole pregnancy, but I always had a hard time imagining what she would look like so I was so surprised to finally see her beautiful face and dark hair. I always wanted a baby with dark hair (I had none at birth) so that was exciting! I was just starting to finally calm down a bit as they assessed her on my chest when I could tell that they were concerned with her oxygen level. They said she had some fluid in her lungs and her levels would drop if they didn’t keep an oxygen mask on her so they had someone from the hospital come over (the birth center is only about a mile away) to assess her and they agreed that she needed to be transported to the NICU. While they were deciding on that, the midwife delivered my placenta (which I saved and had encapsulated by the way) and told me that it looked like I had some fourth degree tears that would need surgery to repair over at the hospital so we would both be transferring over. It’s definitely a lot to take in to hear that your baby needs help breathing and you need surgery (my first!) all while trying to process that you just gave birth to this tiny human and your whole world has changed. We had talked about worst case scenario before the birth and decided that if we were separated like that Todd would go with Lola since it was more important to me that he be with her rather than me. I have to say that it was very strange going into my first surgery by myself separated from my husband and my newborn but I think my brain felt it had to “man up” so all of the sudden I got very calm and was cracking jokes with the hospital staff as a way to cope with the otherwise scary situation. After I was stitched up I wasn’t allowed to go to the NICU to see Lola until I could get into a wheelchair on my own (I had a spinal for the surgery so I couldn’t feel my legs for a few hours) so Todd would send me videos of her and I felt so relieved that she had him there with her to talk and sing to her. I honestly think that’s why they still have a special connection. It was probably 7 hours after the birth at this point but I still didn’t know what she looked like as she had an oxygen mask covering her face since right after she was born. Todd found a picture of her on my chest where they had taken it off for a second so I just stared at that photo all night mesmerized by her sweet face. I did get to see her some that night while she was asleep in the NICU but I couldn’t hold her yet and I had to stick my hands into the holes in her incubator machine to get to her tiny body and hold her hands. It was so hard to see her hooked up to so many tubes and wires and I didn’t want to leave her but I had been up for about 36 hours at that point (and given birth and had surgery in that span as well) so I was pretty exhausted and knew I needed to get some rest. They said they would have some doctors assess her breathing in the morning and she could be taken off the oxygen machine if she was doing well. Thankfully she passed the tests and the next morning I got to go back and hold her (with only a few wires attached) and try out our first attempt at breast feeding as well. They released her from the NICU later that day and she was able to stay with us in our room that night and do lots of skin to skin with us and we could finally stare at her beautiful face and just drink her in. We were released to go home the next day and while it was so great to finally be able to leave the hospital (so hard to get much sleep since they wake you up constantly to take vitals and give pills, etc. ), at the same time, you have so much help there that you’re terrified you can’t do it without them! My parents came down for 10 days to help us pretty soon after we got home from the hospital and we had a post partum doula help us for the day or two in between. I honestly don’t know what we would have done without that help. Having someone make you food, clean up, and watch the baby while you take naps made one of the most difficult times I could imagine more manageable. And so many of our friends helped by bringing us dinners as well and it’s amazing how much a seemingly small gesture like that helps. If you have a friend that’s about to deliver, offer to create a meal train for them- they will be forever grateful! While I would definitely categorize my birth experience as traumatic overall (more on that later), the important thing is that she’s out and healthy and I’m mending pretty well too and that’s a lot to be grateful for. P.S. If you’ve got that baby fever check out what I packed in my birth bag and my newborn essentials list! 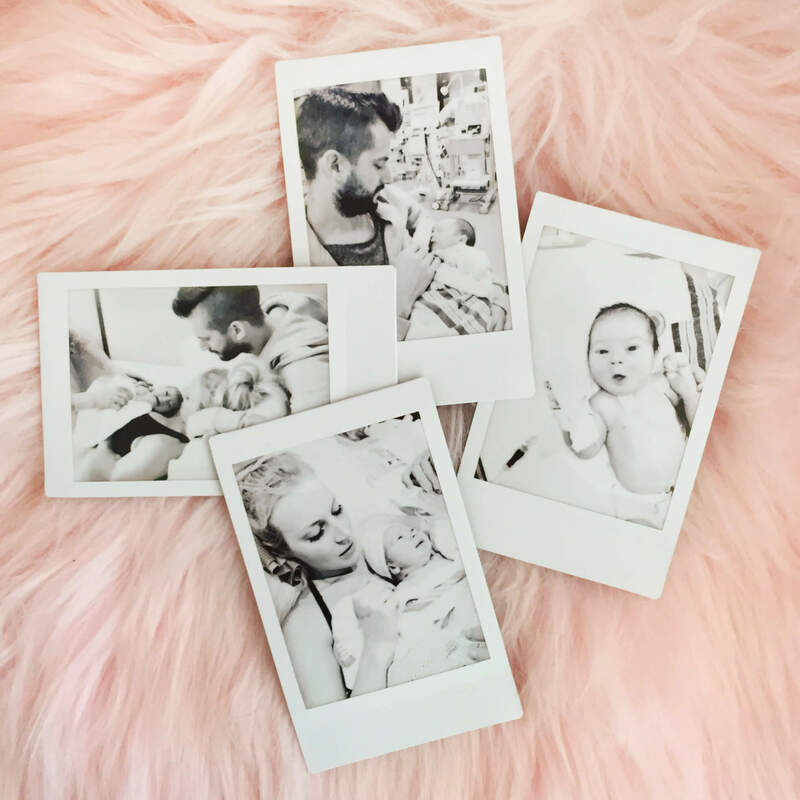 Also, if you’re wondering about the Instax prints with her birth photos, you can use this tiny printer to print whatever photo you want from your phone-YES! Categories: Baby, Oh Baby | August 5, 2017 by thebandwifeblog. Laura-I’ve been following you for a while and thought it was fun when I got pregnant shortly after you announced your pregnancy. I am not nearly as fashion-forward as you, but loved following along on your pregnancy journey and was eager for Lola’s birth in that weird way a stranger on the internet can be. 🙂 Needless to say, your birth story really resonated with me because there are so, so many similarities to my own. Baby boy born July 13th. He was pretty big (8lbs 7oz), so an episiotomy was well-earned in my natural birth. We were at a hospital, but he similarlay showed some signs of distress toward the end, and then came out with fluid-filled lungs. He was whisked away to the NICU shortly after birth and unfortunately stayed there for 7 days with pneumonia. Anyway, we are home and learning about each other now and forgetting the trauma of his first days. I find bizarre solidarity in your story and despite not knowing you, you and your family have been in my thoughts since Lola’s birth. Thank you for writing your story and sharing so much about this experience…you’ve helped normalize so much for me. Sending my best to the Gummermans! 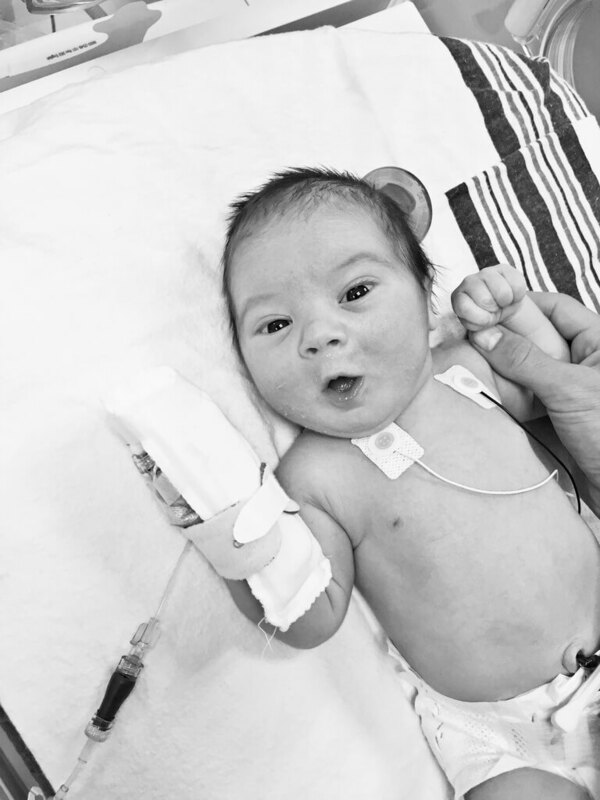 Aw, so sorry you had to go through some of the same things (and an even longer NICU stay!). Glad to hear that everyone is starting to get the hang of it, it does get easier, I promise! Hang in there! Thank you for sharing your story. With social media being such a huge part of our lives we tend to only see the good stuff. So when a traumatic experience happens to you, you wonder why? And how does everyone else’s experience seem like such a breeze? I gave birth to my baby boy June 9th ( my first ) and it was traumatic. It took weeks to emotionally and mentally recover. Even longer to physically recover ( still not 100%) but looking back I wouldn’t change a thing. Our experience is unique and special. Looking into my little one’s eyes, I’m just so grateful. All of that, just to say thank you for being so open and real. I’m so happy for your beautiful family and wish you all the health, happiness, and love! ❤️ Lola is one lucky girl to have such a strong Mama and Daddy! I just delivered my second baby so your birth story really resonated with me too. 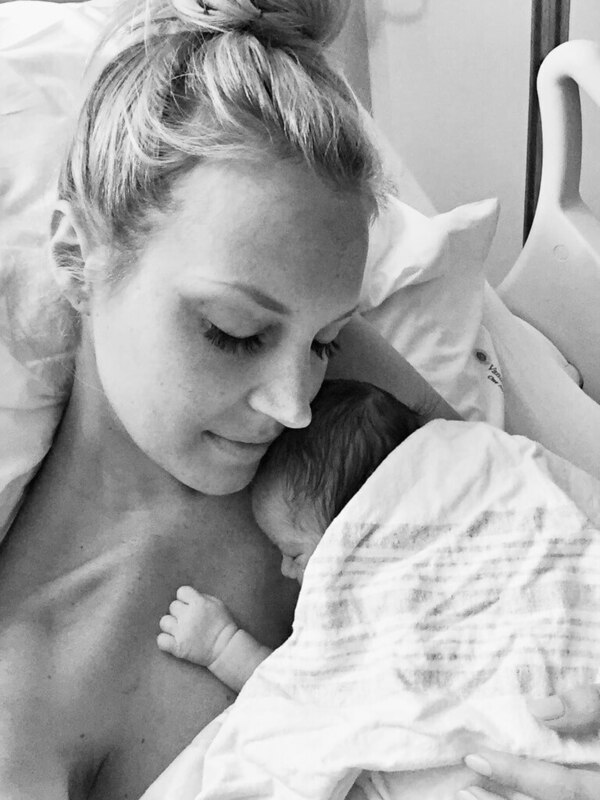 Although your story sounds so terrifying and traumatic, it is such a beautiful example of maternal love-Ensuring your baby’s comfort and happiness above your own. I literally cried when you described sending your husband to the NICU with Lola. What a wonderful and brave mama you are! Lola is very lucky to have you. Thanks for sharing your story! So much respect for you sharing your birth story, especially given that it was difficult for you. I think too often only positive birth stories get written. I gave birth to a little boy 2 weeks after you, and have loved following the two of you, as your Lola is so similar in age. I just read an article on Coffee and Crumbs today about feeling traumatised by birth, and really, it isn’t discussed enough. You are doing a great job, and share the highs and lows of new motherhood so well and honestly. Oh Laura, I’m struggling not to choke up a bit reading this! Have been following your journey on Instagram and figured you must have had a rough labour but oh! You poor poppet, it sounded so traumatic. You’ve done so well to get to where you are now and I’m particularly impressed with the breastfeeding after not seeing Lola for so long after she was born. I promise it gets easier! It’ took me a long time to give myself a break and remember that it’s not only a baby that is born, but a mother too. You’ve got this! I’m so grateful you shared your story honestly. 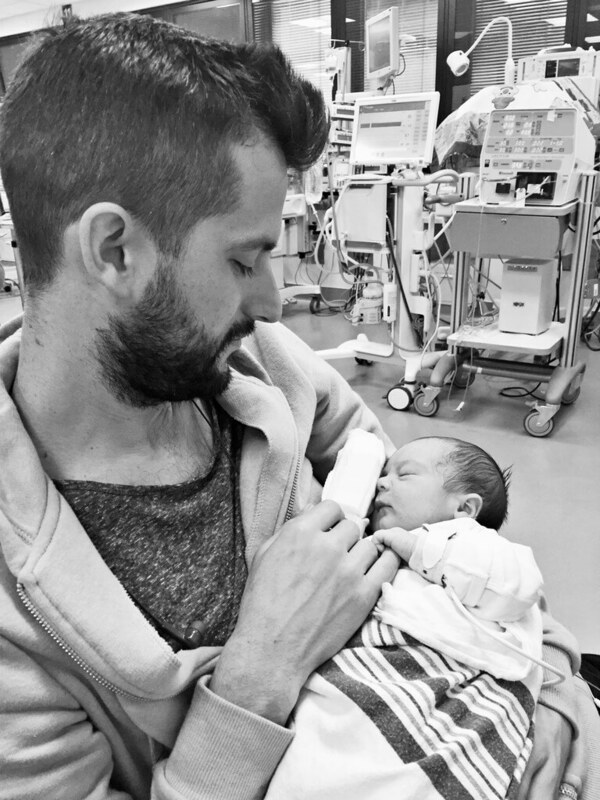 I know it isn’t easy writing about a traumatic birth – even after the fact, even after you feel SO much gratitude for a healthy baby in your arms – it is still very hard and a grieving process to mourn the magical birth you wish you had gotten. I had a traumatic home birth and it was tough for me to accept that I had experienced trauma – I had this picture perfect birth on paper and met all my goals of a natural home birth, but it was traumatic to me. It was really helpful to me to process that birth with a therapist and I’d recommend her since she’s in Nashville too! Her name is Ruth Bryant (with Symmetry Counseling), she’s on Hillsboro Pike and she specializes in helping moms process birth trauma. She used to be a birth doula too, so she knows the ins and outs of natural birth which was SO helpful to me in my healing. She was incredibly compassionate and supportive as I worked through my birth story and helped me come to a place of peace around it so I could birth again without fear. Sending you so much love! <3 You're such a strong, brave mama. OMG, you poor dear girl, what a birth story. I am not pregnant nor I have had any babies so far, but we have been discussing birth experiences with my dear friends quite a lot in last years, since they all have babies, and most of them went through quite some trauma as well. You are so brave! I do not know you but feel proud of you, of how you let yourself be vulnerable and so strong at the same time. Much love to you and your family! 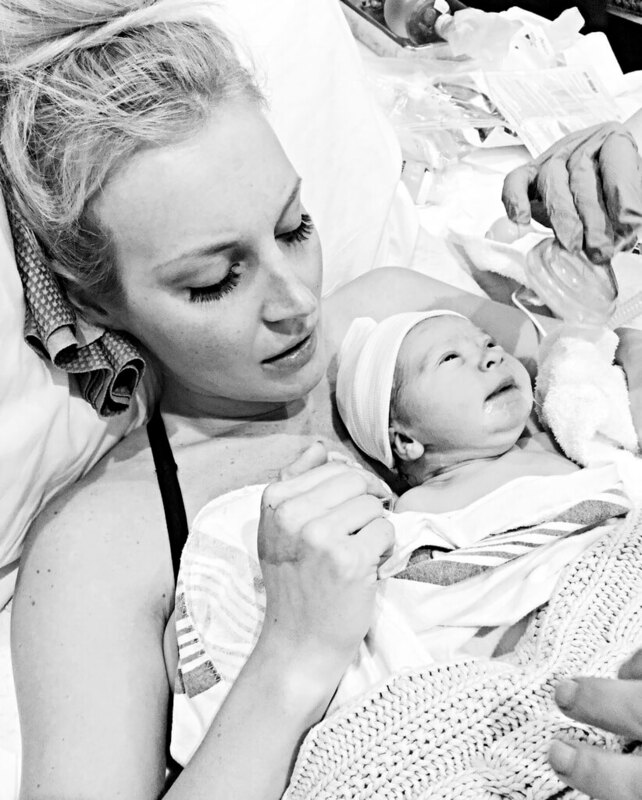 Hi Laura, thank you for being so honest about your birth story! I have a question for you.. I don’t have any children yet and I’m worried about what kind of mother I will be because right now I feel like a miserable zombie whenever I don’t get enough sleep and only recover when I’ve had some sleep, so what’s going to happen to me when I constantly don’t get any sleep if I have a baby. How much sleep are you getting? Thanks! Lots of love to the Gummermans from the Ellis/ Caugheys in Northern Ireland! I totally understand your story. Mine is not totally simular, but a lot is. I hope you continue to heal and your girl is a trooper. Laura, Loved reading your birth story! I feel like you were very honest and real about so many details, so appreciate that! I feel like there are just so many things new mamas like myself just do not know. My intentions are to do a natural birth as well with my first being due November 26. Can I ask what some of your favorite books or blogs were during pregnancy to prepare for birth and newborn? Thanks! How are you? Here Julie, argentinan graphic designer now living and working in Miami. One quick question. I’m 11 weeks pregnant and I’m having issues with my prenatal vitamins (they are way too big and taste bad so they make me feel nauseous) They are the “Garden of Life: prenatal once a day”. Which ones can you recommend me? Thanks and congrats! Lola is beautiful! Hi! Well, I would definitely talk to your doctor about any supplements or medications but I actually took the Garden of Life Raw Prenatal vitamins which sounds pretty similar. I will say though that I didn’t always take them in the beginning when I was super nauseous (they would get thrown up most of the time anyways) but I would say to get as many in as you can especially if you aren’t able to eat well because of feeling so sick. But if you can get it from good food instead, that’s even better! Thanks for all the information you provide on your blog! it’s super helpful for new moms like me, that have no idea at all!! Aw, good for you and congrats! Glad I could help in some way! Adorable. I didn’t realize you had your own blog. You just linked it on ABM.